Me: Okay – what do you guys want to order? Pizza, pasta. Great. Done. And juice to drink. Cool. A moment of calm after the order is placed. Hmm, this could be quite nice. Shorty #1 takes away her straw. #1: Waaaaahhhhh (crying)!!!!! That hurt. MOOOOOMMMMMM!!!!! Me: Keep your hands on your own body, we don’t hurt each other. #2!! No blowing bubbles, that’s rude. #1 don’t boss your little sister around so much. By now, the hipsters two tables over are eye-rolling so hard, I can hear their corneas scraping along their eyelids. #1: That’s not ok, you shouldn’t burp at the table. A moment of calm, so we pull out toys to pass the time. #1 has a pile of Barbies that were in some dramatic play where people were falling off cliffs and miraculously rising from the dead. Note to self to monitor her Netflix watching even more closely. #2 has a couple of cars, one of which is now hovering over her juice. Crisis averted the car is now back on the table. Just then #2 inadvertently leans on #1 and she FREAKS out. #1: Arggghh – quit touching me!!!! Now #2 is sliding off the banquet. Stand up diaper change takes place in the change table-less bathroom while #1 holds the fort. Luckily the food is on the table when we get back and there’s a moment of serenity and we actually start to each talk about our day…. For about 35 seconds. #1: I want some of that pizza. #2 (or maybe #1, I think I’ve blocked it out): What’s for dessert? Maybe we’ll stay home next time…. So…we are about to put our house on the market. Can you imagine the fun and hilarity that is ensuing in our household right now? Right? You can see it – boxes piled up, clutter being de-cluttered, windows and walls being scrubbed. This is SUPER fun. Now we add 2 kids in the equation and the need to be doing all this in the evenings after work. We are talking an incredible time had by all. This is amazing. I could cry. Channeling my inner ’50’s housewife. 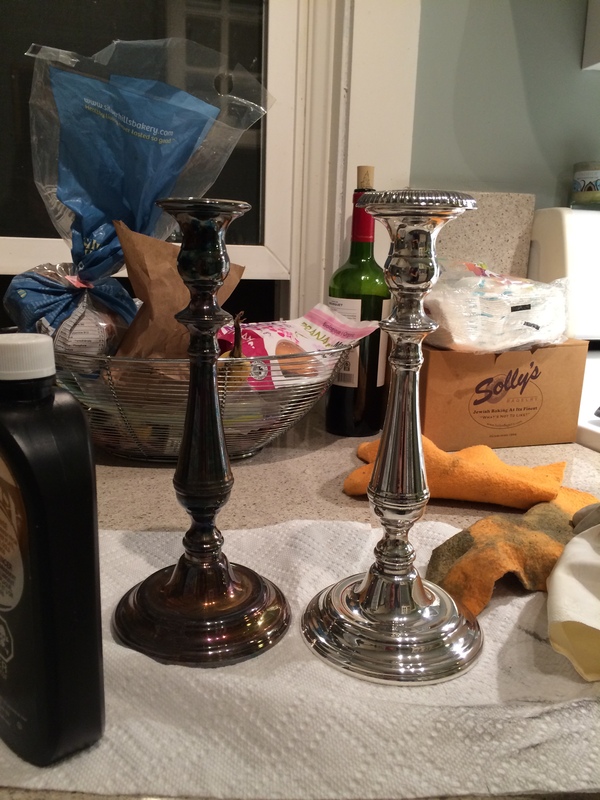 Polishing the silver in my CoH velvet jeans, not so bright…. It all started with the stager. Perfectly coiffed lady arrives at the door. She is PAID to tell me what’s wrong with my house. You can imagine how much I enjoyed that. I wouldn’t let her in without a clear acknowledgement of the fact that we had only moved in to this space 3 months before and in that time I was on the road for about 2.5 months, so the house wasn’t exactly in top form. She began to make the rounds… TV has to go, that mirror is too small, your art is hung too low, oh and this playroom is confusing – it needs to be a bedroom. Excellent. That was a great experience. The short story is that in order to sell your house, you basically need to move out and hire Queen Hairdo to completely refurnish and redecorate the place, all for a very small fortune (ie: far more than it would cost to actually purchase the stuff she says we need to make the place passable). Oh! To make this even more fun, Her Highness doesn’t even do any of the heavy lifting. We’re on the hook for the packing, cleaning, light fixture replacing anyways. So I said “Screw you” to the Duchess of Decor. I got this! And you know what, I think I kind of do… Its starting to look pretty good as we pack up the storage pod outside the front door and give the windows a wipe. A couple new mirrors and lamp here and there, a bouquet of fresh flowers, we can do this. We’ll let you know if it actually works when its time to actually start showing the place. The real trouble now is how do we live in this place with the Shorties for the next who knows how long. That’s the part that’s got me. Shorty #2 is a walking mess these days. She’s like PigPen from the Peanuts cartoons only the swirling dust storm around her also includes yogurt and lipgloss. Have you ever tried to clean dried yogurt off the wall? And NO, I’m not a savage, I do not neglect the mess so it dries – these are the hidden messes those little fingers create completely unbeknownst to you! Plus Shorty #1 is like a 3 outfits a day kind of girl. Not to mention her deep emotional attachment to every single piece of paper on which she’s written, drawn, scribbled or even tested a pen – we NEED to keep them all. I swear to God this kid has hoarding tendencies. We’ll be buried soon. If I don’t post for a while, send a search party. I’m serious. 1. Get a hotel room and stay there until the subjects are lifted from the offer. 3. Pray, hope, meditate – whatever it takes that this whole thing is done quick.